*Rental fees are subject to change. Suite 228 has a different configuration and pricing. Broadened access to the university’s students and faculty for short-term and long-term volunteer activities, campus-wide service days, board service, as well as online connections to the university community to connect to these opportunities. Flexible, hi-tech work spaces for a diverse array of community and university organizations that share common interests in solving community problems, collaboration, reciprocity, and communication. Access to capacity-building resources designed to strengthen the ability of local nonprofit, government, and educational organizations to respond effectively to community needs. Numerous meeting spaces, for both small and large groups, equipped with modern technology. Informal and organic planning spaces that accommodate unique groups. Designated visitor parking located on campus to allow for easy access for visitors and event attendees. 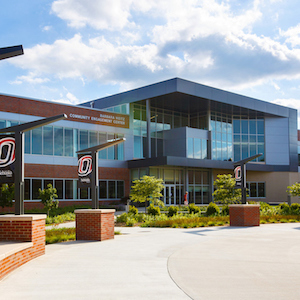 UNO Parking Services offers ample parking on campus for new building partner organizations and their employees. New building partners have an opportunity to discuss payment and parking options once selected and in the on-boarding process. *Parking is separate from the rental agreement, and parking fees and regulations are determined by UNO Parking Services. Individual parking is the responsibility of building partner organizations and the individual. 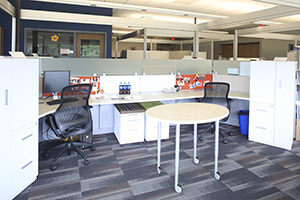 Offices were designed for flexibility and collaboration.